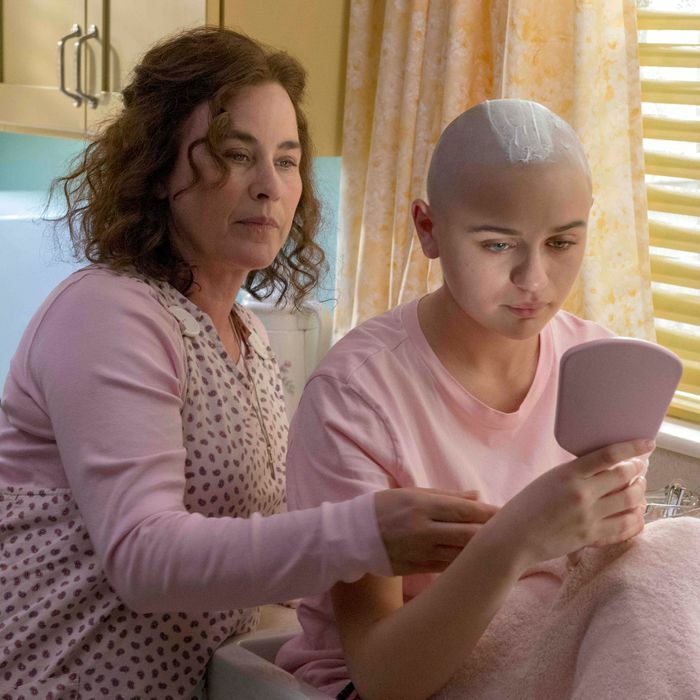 This week, the first two episodes of The Act — a dramatization of the real-life story of Dee Dee Blanchard, a mother who inflicted years of abuse on her child, Gypsy, by insisting she was sick when she was not — premiered on Hulu. Dee Dee’s behavior is consistent with Munchausen by proxy, the name for a pattern of behavior in which a caretaker (typically a mother) makes her child sick through unneeded medications and procedures, often for financial gain in addition to public sympathy. (The name Munchausen comes from German writer Rudolf Erich Raspe’s character Baron Munchausen who vastly exaggerated his achievements.) Still, it’s an extreme case, in which Dee Dee is (spoiler alert!) ultimately murdered by Gypsy’s secret boyfriend. In order to get a better understanding of how this type of behavior manifests in real life (versus on television), we asked Dr. Marc Feldman, an international expert in medical deception and the author of Dying to Be Ill, for his thoughts on the show’s portrayal. With the caveat that there are just two episodes out so far, what are your first impressions of the show’s depiction of Munchausen by proxy? I was pleasantly surprised by it in that it adheres more closely to the actual story than I expected. It also presents the horrors of Munchausen by proxy quite well, although this might be the most extreme case in history. So if anyone looks at The Act and thinks that’s a typical Munchausen by proxy case, one culminating in murder, they’re going to be a bit misled. They’re going to have too high a threshold for making the diagnosis. I was also pleased that the show did have a helpful disclaimer at the end saying that some events had been created, and some characters changed or added, because that was done, and they’re being overt about it. I’ve been asked about this case when I’ve testified about other cases in court, and this case is so extreme that people try to be dismissive of Munchausen by proxy that doesn’t rise to this level. I’ve had to point out that in most cases, the deceptions involve just one or two or three symptoms, and are more subtle. The mother may have other activities besides just caretaking for her child, whereas in The Act, and in the real case, the mother’s life revolved around her daughter and nothing else. Something about the case that makes it also a bit unusual is that Dee Dee actually gave the medications to Gypsy that were prescribed. Often, there’s a certain delight in getting the prescriptions, but not using them, because [the perpetrators] know at some level that they’re unneeded. But it does appear that Gypsy really got the medications, and that that played a role in the tooth decay. Anti-seizure medications can cause teeth to deteriorate, and that seems to have been what happened here, though Gypsy didn’t understand that herself. What would you say is the most unrepresentative part of The Act’s depiction? The biggest difference I saw from reality and most cases is that there was a G.I. specialist in The Act who took control and made thorough attempts to track the medical background of Gypsy. And that didn’t happen in real life. It doesn’t happen in most cases. Doctors spend their time responding to the complaints at hand, and they may only have five or ten minutes to do that. Very few will be able to take the time needed to call around to have releases of information signed, accumulate the records, and read them. Maybe if that had really happened in this case, it would have been discovered sooner. The one doctor who documented the possibility of Munchausen by proxy in real life did nothing about it, and that’s kind of disappointing. I’m still disappointed by that to this day. I’m glad you brought that G.I. specialist up, because one of my questions was why doctors don’t typically get suspicious earlier on. This case also involves what we call malingering by proxy, where they got a house, and money, and lots of other gifts and things under false pretenses. That’s different from Munchausen by proxy, where the goal is to get attention and sympathy. Is this case unique in that Dee Dee had both, or does that happen a lot?Very often malingering by proxy and Munchausen by proxy coexist. A person tends to predominantly exhibit Munchausen by proxy but it isn’t unusual for them to receive gifts, to establish GoFundMe accounts, etc. all to try to make the ruses seem more believable and credible. How do people usually get caught, compared to how we know it plays out in the show? They usually don’t until the child gets too old and starts to resist. I think most cases are never identified. Nobody gets suspicious, because the behaviors are more subtle than we’re seeing in the Blanchard case. When they are discovered, it’s usually because another child in the family has unexplained illnesses or even died for reasons that are unclear. Then you start to find yourself asking, how many times does lightning strike the same family, and you start investigating at that point. You may find a lot of inconsistencies between the child’s medical history as given by the parent, and the actual medical record. But of course, in the case of Ms. Blanchard, she claimed the records were mostly lost, and doctors had to rely on the mother even more than they normally would. We also get concerned when we see that the symptoms don’t match your medical observation. For example, in the Blanchard case, the pediatric neurologist noticed that there was no muscle loss in Gypsy’s legs, as you would expect with somebody who’s wheelchair-bound. But again, he didn’t do anything about that. But that’s the sort of hint that can get dropped along the way, and, if you’re knowledgeable about Munchausen by proxy, will trigger an investigation. In The Act we see a few striking shots of Dee Dee’s massive pill closet, which she often utilizes for her own “needs.” Did you find that accurate? That does happen. In about 30 percent of cases, the perpetrator, which is almost always the mother — it’s the mother in 95 percent of cases — has a history of feigning or inducing illness in herself. And that behavior may continue even after the Munchausen by proxy has begun, and she’s extended the behavior to the next generation. They may still take unnecessary medications. Now, I’m not aware of any cases off the top of my head where someone has forged prescriptions by stealing a prescription pad as occurred in this case, and that may have been an invention. I’ve actually had a number of patients and families who’ve taken photographs of the stacked pill bottles and emailed them to me, and they can be massive. Not as massive as in The Act, but it wouldn’t be surprising to see two, three dozen pill bottles based upon what people are showing me in these cases. In the show, Dee Dee’s neighbor Mel is pretty immediately suspicious of her. Is it common for perpetrators’ friends or family to take notice, and get suspicious like that? No, it’s not usual that they get suspicious early on, unless they have sufficient medical expertise to know nobody has as many ailments as Gypsy allegedly did. There was a claim that she had multiple sclerosis, which is flatly ridiculous. If somebody had even the most mild medical awareness, they would know that couldn’t be true. But who would imagine that when a mother tells you her daughter is terribly ill, that she’s lying about it? It’s the last thing that would occur to you. So these cases, for that reason, can go on indefinitely, even when the deceptions are fairly crude. Nobody wants to believe it. I’ve had cases that, as a physician, I find utterly outrageous from the start, but doctors have gone along with it, or doctors haven’t been seen. The lies have just been told to the community, to church groups, to family and friends, but actually, medical care wasn’t sought, and that can still be Munchausen by proxy. The point is to get attention and sympathy; it doesn’t necessarily have to be from doctors. Speaking again of the neighbor character, Mel — Dee Dee very clearly wants her approval and friendship. Is that party of that same sympathy seeking drive? Yeah, I think so. These mothers can be very ingratiating, and often in the hospital they’re seen as ideal parents: really caring, involved not only with their own children, but with other patients, supporting families, displaying medical knowledge, being helpful. And that’s why they’re sometimes allowed to do things that aren’t wise, like mix up the child’s formula in the hospital, which can then be poisoned, or being allowed to instill things into gastric tubes, which are just ubiquitous in these cases. I barely remember the last case I had that didn’t involve a gastric tube. Doctors have a very low threshold for putting them in, and we saw that it looked like Gypsy had one for a very long time. Why is that? It seems like a fairly serious procedure to do without absolutely knowing it’s needed. I think it’s not a huge procedure to put the child through, but again, when the mother says the child isn’t eating, or is regurgitating everything they try to take down, you assume there’s a problem with reflux or intake, so you do the procedure. Now, I do know of at least one hospital system that is aware enough of the false pretenses that lead to some gastric tubes being placed that they’ve initiated a formal study of it, and review every case really thoroughly before they proceed with the surgery, but that’s a dramatic exception. Are these women often single mothers like Dee Dee? Or if there’s another parent around, what role do they usually play? Three quarters of them are married or have close partners, but a lot has been written about the fathers in these cases, and when they’re around, they seem to do almost anything to avoid being aware of what’s going on. They tend to have very traditional views of child rearing, and view it as just something the mother does, and they decline to get involved in any way. I don’t know if you saw the series Sharp Objects, but you saw there the father constantly busy with his stereo, his headphones on, even when disturbing things were happening in the home, and that’s a pretty accurate characterization of what goes on with these fathers. Only in about 1–2 percent of cases is a father the perpetrator. Some of them, the evidence is right in front of their eyes, but they don’t say anything. They can even be your worst opponent as you’re trying to adjudicate these cases, because they steadfastly defend the mother regardless of the evidence, and they can get physically hostile too. What about the depiction of Gypsy’s realization that she isn’t allergic to sugar? How do these victims come to find out that they’re not sick, or being made sick? Sometimes they never figure it out, because they, like everyone else, believe what their mother tells them. But Gypsy’s case went on longer than most do. Most kids may start to resist earlier in life, or just through their behavior in attending school, and eating things there and doing things there, it becomes evident to everyone that they’re no longer sickly. But Dee went further, and was supposed to be homeschooling Gypsy, which was a further way to keep her isolated, and in most cases, the isolation isn’t as absolute as it was in their case. Do these mothers know what they’re doing is wrong? When the child services person comes to Dee Dee’s house, for instance, she behaves very guiltily and tries to hide that prescription pad. That’s an important question. I think there is almost always an awareness of what they’re doing, because you can see the considerable planning that takes place. But they may honestly not know why they’re doing what they’re doing, and therefore they put it out of their minds. They may not have any insight into their own psyches and motivations to be able to discern that what they’re doing is absolutely wrong. And in fact, the American Psychiatric Association (APA) now does say that this is a form of mental illness. That represents a big change. Prior to 2013, Munchausen by proxy, though it goes by a different term in the APA nomenclature, was not believed to be a mental illness. I still don’t think it’s a mental illness. I think it’s a form of abuse. But I was outvoted by the rest of the task force working on this. Today, people like Dee Dee can try to get off by claiming to be the helpless victims of a mental illness, namely Munchausen by proxy, and I think that would be a real miscarriage of justice, because they know precisely what they’re doing. They’re not accidentally accumulating bottles of pills. They’re doing it deliberately. They’re not accidentally lying to doctors, they’re deliberately doing it. I think that needs to be acknowledged, and that’s different from just about every other mental illness.